File this under X-Files creepy. This is not a scene from PROMETHEUS. Because once this thing springs to life, we are all doomed. John-Boy Wrote For The Twilight Zone! Yeah, wrap your head around that one! My wife and I were watching The Waltons the other day. Yeah, you heard that right–I was watching The Waltons. It’s really a very good show–even today. Tame, to be sure, but extremely well-written and well-acted. Anywho, as my wife and I were talking about Earl Hamner, Jr.–whose name really had a familiar ring to it besides it being from The Waltons–we did some Internet searches…and found that (I’ll be damned!) Earl Hamner, Jr., had written eight Twilight Zone episodes! Ergo, John-Boy–who is obviously the character for Mr. Hamner, Jr.–left Walton Mountain and ended up writing for Rod Serling! Marc Schuster (The Grievers [order now! ], college instructor, blogger, book reviewer, artist, musician, husband, and all-around masked super hero) has reviewed my 2001 novel. From what I’m learning about the guy, there’s no other way than to just say it: he’s COOL. Thanks, again–and again!–Marc! 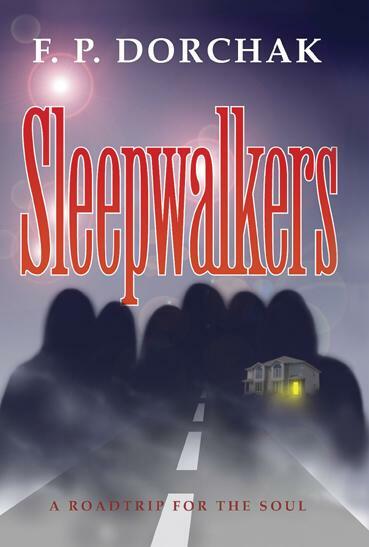 Like the subtlest of dreams, FP Dorchak’s Sleepwalkers opens with both feet planted in the real world and gradually evolves into a full-blown mind-bending novel of ideas over the course of the next 300 or so pages. The novel follows the journey of protagonist Daniel Grant, a middle manager downsized into a life of uncertainty and self-doubt. Despite his best efforts as remaining positive, Daniel feels himself slipping under until a series of mysterious dreams awaken in him the possibility that the life he’s been living is but one iteration of the possibilities open to him. Haunted by a dream-version of himself, Daniel embarks on a journey through multiple realities in a quest for nothing short of the meaning of life.